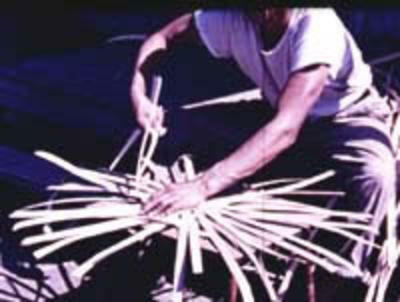 1) Maliseet Basket Making at Woodstock, N.B. Collection contains [Nicholas Smith--home movies]. The majority of the film is a record of the Meductic-Old Town trail, the historical route from New Brunswick, Canada to Old Town, Maine. The trail was established by Native Americans and later served as a trading trail for the French and transportation route for early colonial settlers in the 17th century. The film recreates the journey by canoe of John Gyles, captured by Maliseet Indians in 1688. It depicts techniques for canoe travel including portaging and negotiating rapids. The remaining footage records the life of the Cree Indians of Lake Mistassini in Northern Quebec, Canada. Collection also contains "Maliseet Basket Making at Woodstock, N.B.," a record of traditional basketmaking, as well as dances filmed at the 300th anniversary celebration of the Odanak reserve in Quebec. Nicholas Smith has studied and written about the Maine and Maritime Indians for five decades and has traveled the length of the Meductic-Old Town trail. The area around the Maliseet village on the St. John River depicted in this film is now under water as a result of a hydro-electric project.